We seemed to have spent quite a bit of time in this area so it seemed a good subject for the next blog post on this Somme Trip thread. The close of the Somme Battle in Nov 1916 had given the British command of both sides of the Ancre with the Germans in a salient projecting westwards . 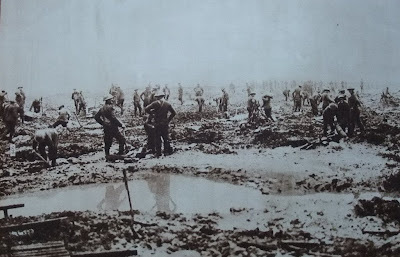 The Battle of Boom Ravine was planned as a 'bite and hold' operation to pinch out this salient from the south in order to obtain better positions for the resumption of the offensive proper in the spring of 1917 (the Germans spoilt the plans for the resumption of the offensive proper to some extent by retiring to the Hindenburg Line). Above: Regina Trench Cemetery which overlooks Boom Ravine (Boom Ravine can be seen in the background of the colour image). This trench was captured by the Canadians between Oct 1st and Nov 11th 1916. By this time it was not a trench as such but rather a collection of shell holes organised into a series of defensive posts. The battle, which took place on Feb 17th, was notorious on two accounts: the weather and the supposedly treachery of two deserters who revealed to the Germans the time of the attack. There was a biting five weeks of frost in Jan and Feb 1917: "Intense cold was experienced at this time. The ground, like iron, was covered with snow. The frost was intense, one man being frozen stiff at his post on sentry, and drinking water carried to the front line arrived as lumps of ice, from which bits were chipped for eating" - 23rd RF Battalion History. Above: Two images of German trenches showing how they turned into liquid mud after a thaw. 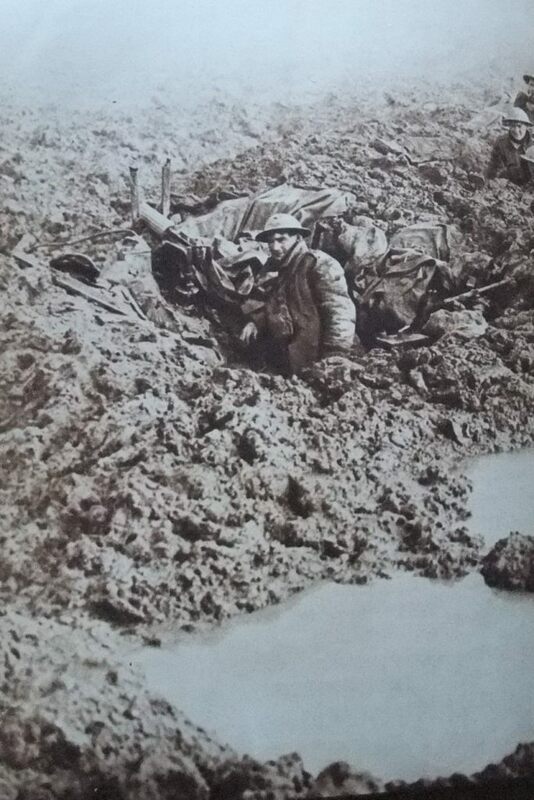 The attack was timed for 05:45am on the 17th Feb. 18th Div was attack through Boom Ravine, 2nd Division on the right flank and 63rd on the left flank.A very rapid thaw had set in the day before resulting in the ground becoming "deep and heavy with slush and mud". The day of the attack was misty. As stated above the Germans knew the British were coming and opened a barrage as the British troops began to assemble at 5.00am . The 11th RF were particularly hit hard while assembling in The Gully / Oxford Circus. The fighting during the day was described as desperate and confusing with parties of troops often losing their way in the mist, often never to be heard of again (this was the fate of Capt Simons with one platoon of C Company, 22nd RF). 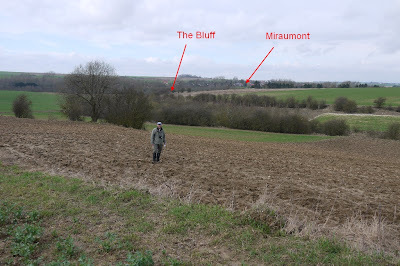 At the end of the day, Boom Ravine was in British hands but not the final objective of Miraumount. However it was further proof to the Germans that their position on the Somme was no longer tenable and they began the withdrawal to the Hindenburg line soon after. 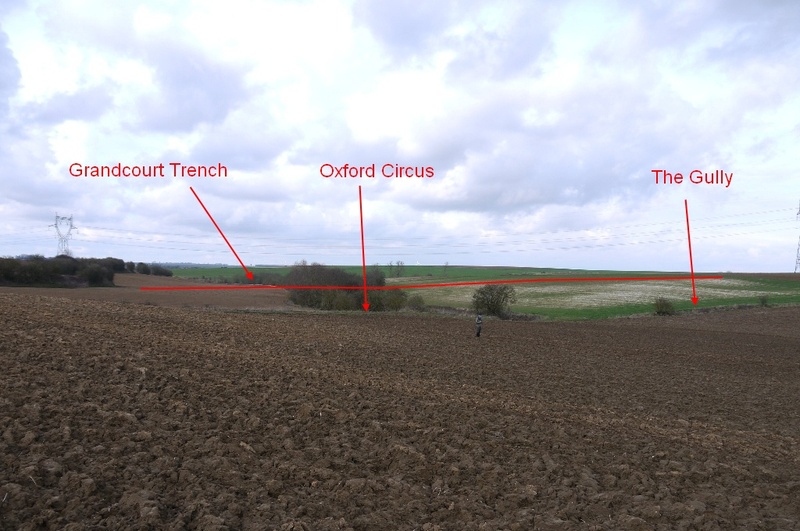 Image 2: The top end of Boom Ravine today showing the approx positions of 'Oxford Circus', 'The Gully' and Grandcourt Trench. Image 3: Foreground shows the position known as 'The Mound'. In the background can be seen the ridge on which the attack was brought to a halt on 18th Div's front. Many Germans counter-attacked from numerous dug-outs in 'The Bluff' temporarily driving the British back although in the end a line was established just short of the crest of the ridge. Image 4: West Miraumont Road - the approx position in which the 22 RF attacked - in the mist and confusion Capt Simons with one platoon of C Coy headed off into Boom Ravine (to the left of the image) by mistake and were never heard of again. Now with over 90 years plus gone by, with a temperature of what must have been 65F plus on the second time we were in the area it was almost impossible to imagine the above took place. Above: Image 1: A casualty of the Battle of Boom Ravine. Major Walsh (22nd RF) was mortally wounded while tackling uncut barbed wire which was protected by an unexpected machine gun. He was buried in Ovillers Cemetery on Ash Wednesday, Feb 21 1917. Image 2: A 'dud' 9" shell - the size can be gauged by the metal object on the right on which the hazard tape is tied to - this is a pickaxe head. Well actually managed to use all my annual leave up this year - still a few days left after arriving back from the Somme. On Tue went back up to the Eastern Command Line (more on that later) but today went up to Covehithe in weather that was more like mid June! Ended up at The Warren, much WW2 activity in this area although most now long gone due to coastal erosion - but a pillbox does still survive (think I may have posted on it before). A quick look in the wood produced a pleasant surprise in the remains of what may have been the ablutions area of the Easton Wood Coastal Battery. Nothing much left except a drain manhole, a few bricks, broken pottery and some bottles but never the less still a fragment in the landscape surviving from WW2. It is worth noting I have found similar pottery and bottles at Diver sites - I must admit I have not checked the locations lists for any Diver Batteries in the area, lazy I know and often leads to misleading conclusions but the whole process of converting Cassini Grid References just takes so much time. Much easier to jump to the conclusion that these are the remains of the Coastal Battery as I know for definite that it was here!! Image 3: Water cylinder - may or may not be from domestic site but I have found similar cylinders at other WW2 sites. Image 4: Pipes protruding from the cliff top. Image 8: Byrlcreem Bottle - probably the most common bottle I find! Next post will be back to The Somme - probably on the Boom Ravine area. Hollesley - 11th Highland Light Infantry and Horse Event! In 1941 the 11th Highland Light Infantry (15th Division) were tasked with the defence of the Suffolk Coast between Bawdsey and Orford. Battalion HQ and HQ Company were distributed around Hollesley. 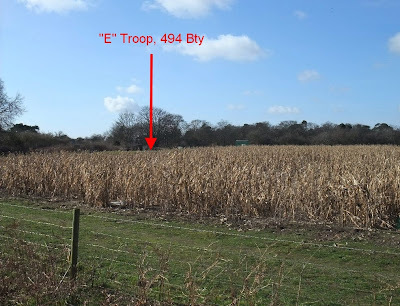 No 3 Platoon (Mortar), No 4 Platoon (Carrier) and No 5 Platoon (Pioneer) were situated in copses just to the west of Poplar Farm. 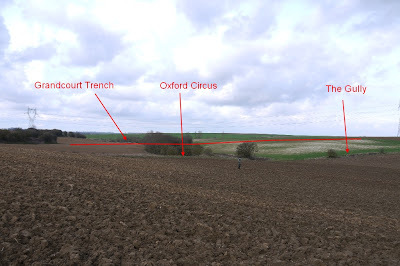 This Sunday I decided to have a look for any evidence in these copses remaining from the occupation by these platoons. Unfortunately an Equestrian event was also being held in the area during this weekend. I decided to persevere on recoding remains of corrugated iron, 4" iron pipes etc much to the bemused looks from many horsey people! I also had a continuous commentary of the progress of various horses around the coarse from the loudspeakers (Susie Prank and Bonnie Prince Charlie are two horses I remember for some reason). 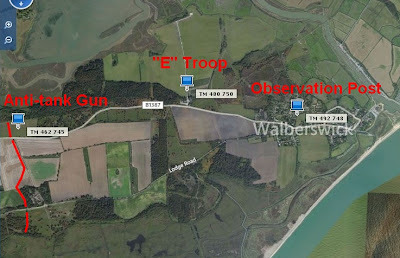 Above: The copses in which the HQ Platoons were located in - the cars and horse boxes from the event can be seen on the RHS! These platoons were no doubt located in the copses as it would provide camouflage from aerial observation. The War Diary does not have any details on the type of accommodation (would troops have been billeted in Hollesley but the Carriers / equipment etc kept under cover in the copses?) but location statements prove the platoons were here between April and October 1941 at least, so presumably for such a long stay, huts would have been provided. The only remains I came across was one screw picket, some corrugated iron sheets, and parts of the water supply or sullage system. Although there was no evidence of any huts etc I did come across some shallow ditches laid out in squares which could have been for draining surface water from the vicinity of huts. Above: Top photo shows part of shallow ditches laid out in squares - surface drainage for huts etc? Rest of the photos show either remains of the sullage system or water provision while bottom image shows a solitary screw picket I came across. A lot of angle iron also used in fences in the area - perhaps left overs from the War. Not the most exciting post I know, but still another little piece of evidence recorded on the ground, and it is always enjoyable to find evidence of details given in War Diaries. Will return for another look at some time when no horses around! Well, soon off to the First War battle fields in France again, so expect a run of blog posts on this trip when I get back. A new camera to play with as well, but we'll have to wait and see if the pics are any better! French "Canon de modele 1897": a revolutionary design at the time due to its recoil system allowing the gun to be continually fired without relaying after every round fired. 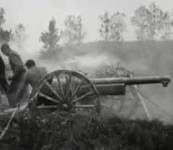 The gun was the standard field gun for the French during WW1 and the American army were also widely equipped with it. Although America began to manufacture the gun in 1918, very few were shipped to France as most American batteries were equipped with French manufactured guns. America retained these home manufactured guns, largely for training. After Dunkirk when British forces lost many of their field guns, 600 M1897 guns were purchased from America. They were used in Field batteries and also as anti-tank guns. Although the gun was basically the 1897 model, many guns did have their carriages modified. The gun fired shrapnel or HE shells with a muzzle velocity of 500 mtrs per second and a maximum range of 6,900 mtrs. This meant a flat trajectory although this could be improved by digging a pit for the trail, although I have found no mention of this being carried out in the War Diaries. 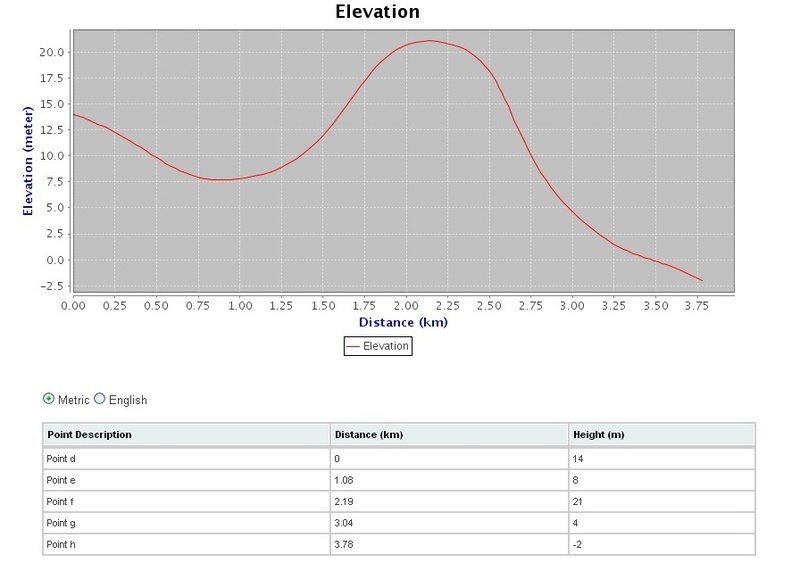 As a matter of interest I plotted two elevation graphs from the UK Grid Reference Finder website for the Forty Acre Covert position, for the battery's two Defensive Fire tasks. These show that the shells would need to reach a height of at least 5 mtrs for "crest clearance". Distance 0.00km in the above graphs is the battery position. 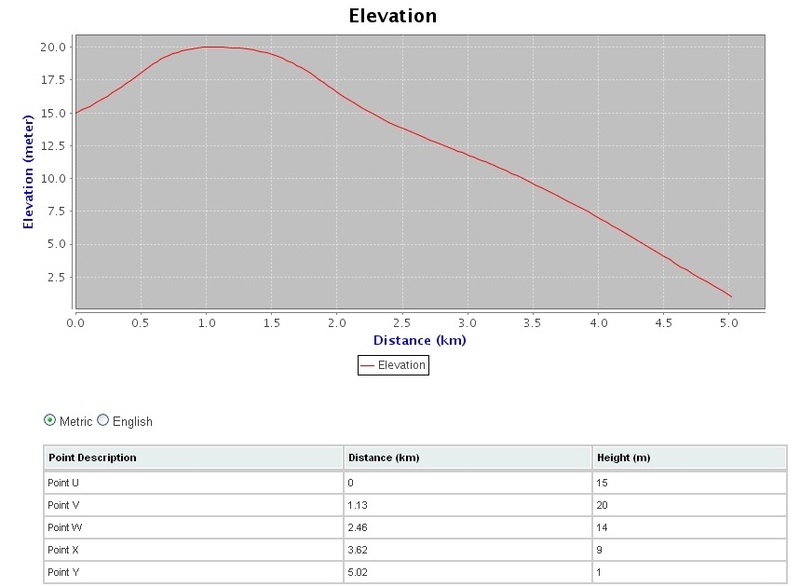 I basically plotted a few points in a straight line from the battery position to the Defensive Fire Task. 75 mm Gun Model 1917: Early during WW 1 the Americans adopted the 75mm gun as its standard field gun. 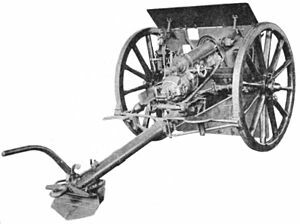 At first difficulties were experienced in manufacturing the French model 1897 so in 1917 a 75 mm gun which was basically the British 18 pounder re-chambered to fire French 75mm ammunition was introduced as an interim measure. After Dunkirk, America shipped its remaining 75mm model 1917 guns to Britain. Above: American M1917 75mm gun - very similar to the British QF 18 pounder. One anti-tank Regt was experimenting with pneumatised 75mm's fitted with platforms. It was found that the original balance of the gun was destroyed on the pneumatised guns so experiments were being carried out in adding a Traversing lever. If damage was caused to the recoil system on the 75mm (French), it could not be made good in this country. It was essential that troops were instructed in the maintenance of the recuperators and that these instructions were strictly adhered to. An interesting note on the state of training in anti-tank gunnery can be found in 129 Field Regt's War Diary. Many officers were noted as not knowing the drill for anti-tank shooting with 75mm's (and 25 pdr's) and were therefore incapable of training their detachments. The standard of many officers from Battery commanders downwards was low on observed shooting. This was largely due to lack of experience in seeing live rounds fall on the ground. As the Commander in Chief considered that engaging enemy tanks would be the most important role that Field artillery would be called upon to perform during invasion, anti-tank training was imperative. At first training would be carried out on a Vaudrey Range (a miniature range with miniature moving tanks with a special rifle or bren attachment fitted on a 2 pounder gun) before moving to firing at practice camps where live rounds were used supplemented by plugged HE rounds (for 75mm and 25 pounders; for 18 pounders plugged HE or shrapnel shells with fuse set at safety were used). (d) Communications to bring each new position within the Signal Plan of each Sub-Sector". I had a look for any remains of the new position for E Troop at Tinkers Walks but could find no trace. 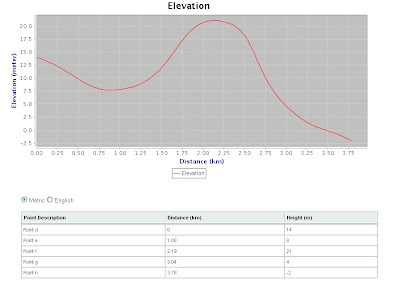 It is however still easy to visualise the position in the landscape. This post will hopefully illustrate this and also look in more detail at the tasks of this field battery. 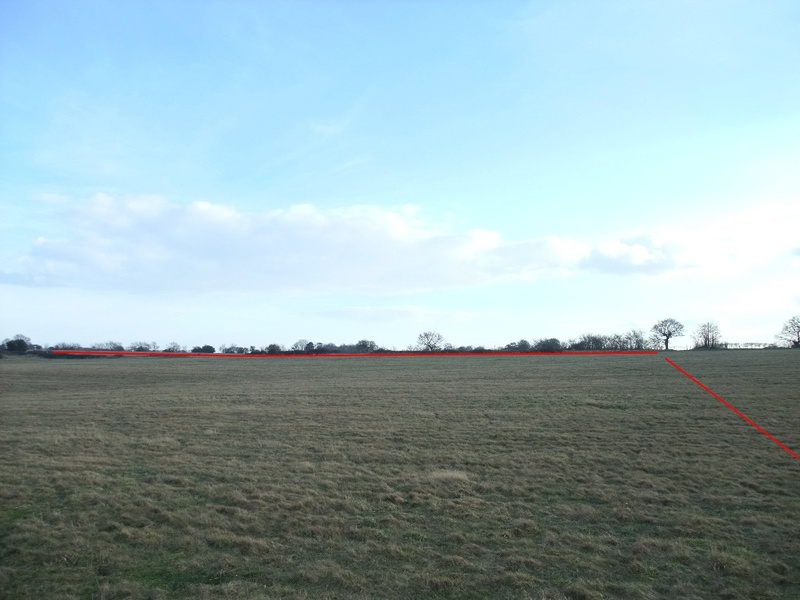 The battery and its wagon line was sited in the vicinity of Eastwoodlodge Farm. The main observation post was in Walberswick and described as being in the "house with a tower". Above: The battery was situated in ground just to the north of Eastwoodlodge Farm. 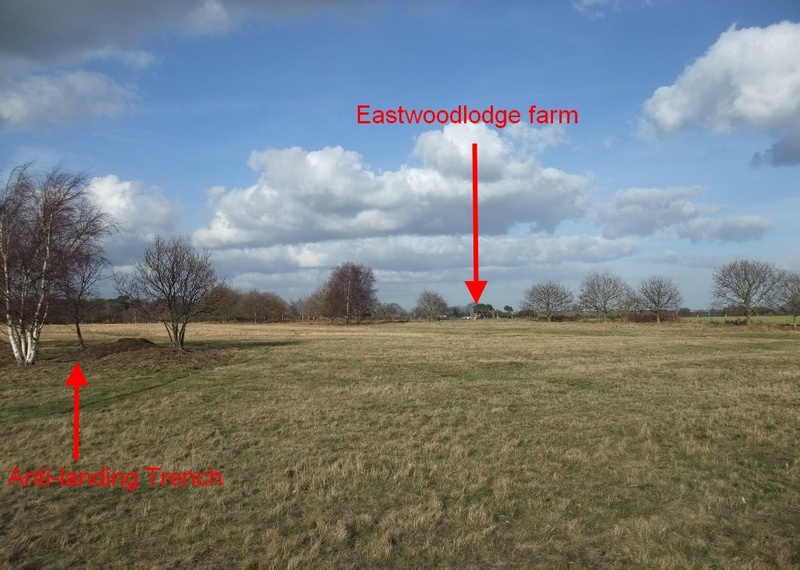 Bottom photo shows Eastwoodlodge Farm in the background, photo taken from Tinkers Walks. 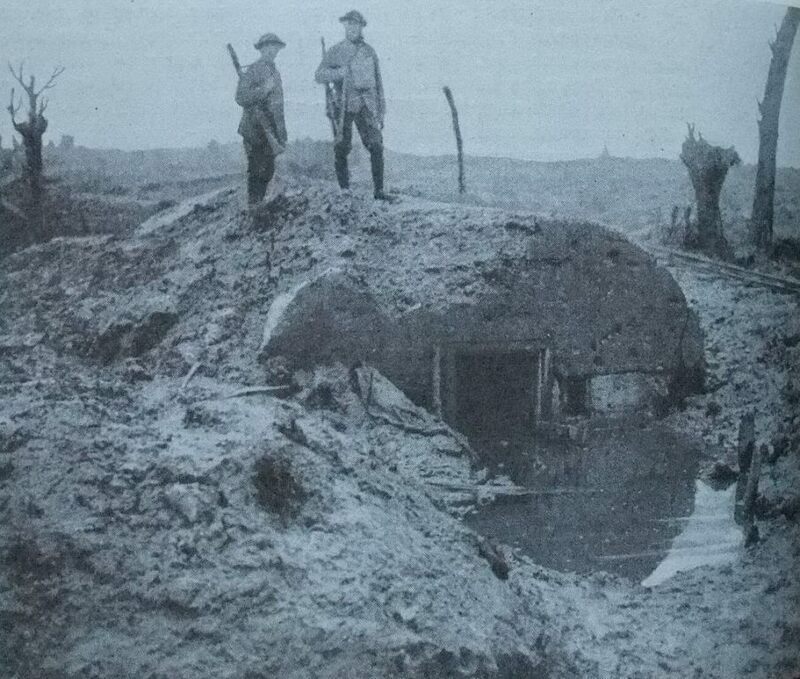 An anti-landing trench can be seen on the left hand side. The battery had predetermined Defensive Fire Tasks and Concentration Fire Tasks. The guns should be able to be fired in any direction, including westwards. To fire westwards would mean running the guns out of their pits - positions were to be marked out for this. Defensive Fire Tasks were called for by the infantry by telephone and / or by putting up the SOS signal (i.e. Golden Rain rockets). This was to be answered by 10 rounds per gun. Rapid fire for 75mm's was set at 4 rounds per gun per minute. After firing on a Concentration, guns were to remain laid on the target for five minutes before relaying on their Defensive Fire Task so as to be ready for "REPEAT" calls. Above E Troops Defensive Fire (P.D.F 21) and Concentration Tasks (P 74, P77, P80 and P83). Other batteries would also have the same task so for concentration fire D/51 Heavy (two 6" guns) could also engage P.D.F 21 and E Troop could also engage P.D.F 15 and 18. For Concentration Tasks a total of four 25 pdrs and twelve 75mms (including E Troop) would engage P74, eight 75mm and two 6" guns P77, P80 and P83. Note all Defensive and Concentration Fire Tasks were at least 200 yards out to sea from the high water mark. "The greatest possible care will be taken over camouflage. Camouflage will be put up before the first sod or brush is cut". The above, not surprisingly, ties in with manuals of the time. The anti-tank gun was a direct fire weapon and relied upon surprise and concealment. "They must therefore be sited defiladed from the front, be well dug in, and should engage tanks in enfilade in order to avoid striking the tank in front where the armour is thickest. Camouflage must be of the highest order.....a gun spotted by the enemy must be taken as useless...". Once a gun had been located it was German practice to stage an immediate encirclement movement with other tanks to destroy it. As a result anti-tank guns were supposed to be sited in mutual support but there was simply not enough guns to go round for this in 1940/41. Alternative positions were also essential - "if guns are not fully dug in and do not move after a successful engagement, they are in danger of being destroyed before the next assault, or neutralised during it". 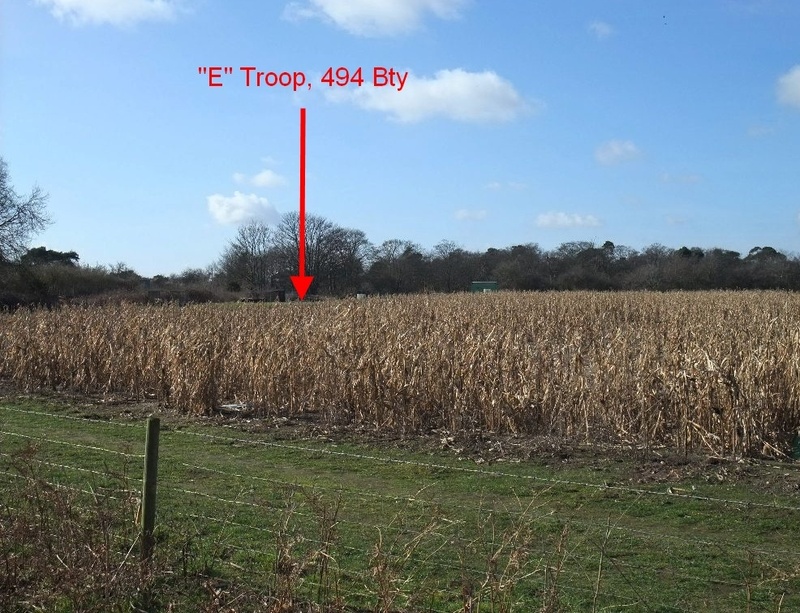 Above: Top - position of E troop, Observation Post and anti-tank gun. The location of the anti-tank ditch is marked in red. Middle: Photo taken from the approx location of the anti-tank gun. The location of the anti-tank ditch is marked in red. 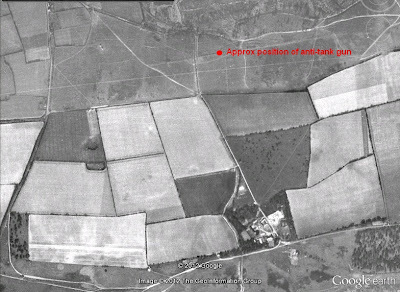 Bottom: Aerial photo, 1945 showing the anti-tank ditch with the approx position of the anti-tank gun. The battery was to be manned by sufficient troops to operate the guns in an emergency within 30 minutes during daytime or 5 minutes during night time in normal conditions. On "Stand To" it was to be manned by the full detachment. The Observation post was to be manned permanently by one assistant and one signaller during normal times. On "Stand To" an officer was to be present. 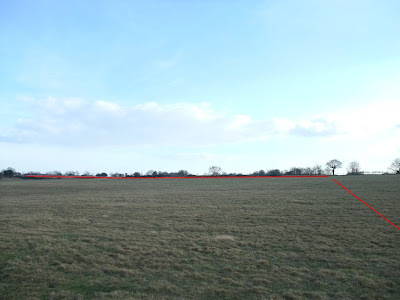 The Wagon lines were sited close to the battery, probably in line with RA 15th Div Operating Instruction No 38. This Instruction stated that on "Stand To" wagons were to be brought up to the battery position if there was adequate cover or to the nearest infantry locality in order to increase the mobility of batteries during active operations and also to provide additional personnel to defend the battery position. The final post in this thread will look briefly at the 75mm gun.